Ballet West Principal Artists Chase O'Connell and Beckanne Sisk in Sir Frederick Ashton's Cinderella. Photo by Beau Pearson. Ballet West’s production of Sir Frederick Ashton’s 1948 story ballet Cinderella, last performed by the company in 2013, was well-wrought and thoroughly charming. Production decisions were made in appreciation of the structurally simple narrative of the fairytale couched in timeless pastiche. The spareness of the classic staging left space for overblown caricature, a legacy of British comic revue, which was committed and hilariously effective. These comic elements further served to emotionally offset the genuine sweetness of the romantic leads, eloquently and beautifully expressed by Arolyn Williams in the titular role on opening night. Many creative choices favoring stylistic and artistic commitment made Ballet West’s Cinderella successful, all of which were exemplified within minutes of the first act. A storybook scrim - the first of many - lifted following the overture, to reveal the implied architecture of a painted set, minimally furnished, and which, as a background arguably ought to, instantly read then faded. The Ugly Stepsisters immediately drew the focus of the scene. Their antics, including an anachronistic Charleston, were engaging and truly funny. The styling and execution was true to the Stepsisters’ theatrical forebears, dames en travesti, and was nearly as entertaining and provoking as the contemporary drag it prefigured. Artists of Ballet West as the Ugly Stepsisters. Photo by Beau Pearson. Williams’ Cinderella was reserved, occupying the periphery, but never seemed cowed or shamed by her station: less a servant than a grieving young woman empathetic towards her family’s shortcomings, and a welcome interpretation, as martyrdom is ennobling but not necessarily endearing. The role was originally choreographed with Dame Margot Fonteyn in mind and performed, due to injury, by Moira Shearer (star of the classic film The Red Shoes); both dancers were known for their emotive merit, and Williams was equal to the role in every way. In a poignant repeated theme, when she alone held the stage, Williams turned her back and perched en pointe on the elevated hearth to just barely reach the portrait of her deceased mother. It was an especially effective moment, as her petite frame was coupled with her powerful expressive quality. She descended from the mantle into the iconic, animated duet with her broom, which she held aloft over some truly gorgeous piqués en attitude, made all the more dreamy for being subtly lit with a single follow-spot. A small misstep was the overly dark lighting of the Fairy Godmother’s sudden emergence from the cowl of the beggar woman, but the entrance was one of many instances of old-school magic and stagecraft that delighted throughout. Emily Adams’ Fairy Godmother was poised and gracious, offering transformations to which Cinderella nodded enthusiastic assent. All the gestural movement in this exchange, indeed throughout the ballet, was explicit and discernible. The Fairy Godmother presented each of the Fairies of the Four Seasons, successively revealed by lifting a sheer curtain on representative solos - all of which were sharp and well-matched to Prokofiev’s suites. A highlight of Act I, Scene II was Adams leading the Fairies through an escalating series of small, brisk brisé and pas de chat, which then progressed into larger, trickier allegro steps as an incredibly tight and fluid ensemble. It was gratifying to see Adams and the Four Seasons, all principal artists or first soloists, perform their dynamic solos, and then move in energetic unison to such an inspiring degree. Soloist Katlyn Addison as the Fairy Godmother, with Artists of Ballet West as the Fairies of the Four Seasons. Photo by Beau Pearson. A pumpkin was acquired and dispatched with admirable speed to bring forth Cinderella’s coach, escorted by tutu-clad Stars whose arms clearly evoked the hands of the clock that inched towards midnight. As the scene ended, a charismatic and newly arrayed Williams was en route to the royal palace, looking bright and hopeful. Artistic Director Adam Sklute nicely articulated the subtle pathos of the ballet in his program notes, but overstated the populist subtext in its “triumph of simplicity over excess” juxtaposed against Cinderella’s “corrupt and materialistic” family home. Both, however, would have been informed by the conventional interpretation of the ballet and the historical context of Prokofiev’s composition, and were still an appreciated inclusion. (Then, as now, it was less the thematic content of ballet than its accessibility that may have rendered it classist or elitist; for instance, ballet’s ability to procure top-tier, publicly funded grants, in addition to private endowment, while still, at times, lacking ticket prices commensurate to the median income of said public). Thankfully, some classic pitfalls of the genre are avoided in Ashton’s Cinderella, and Ballet West’s presentation made the most of the opportunity. 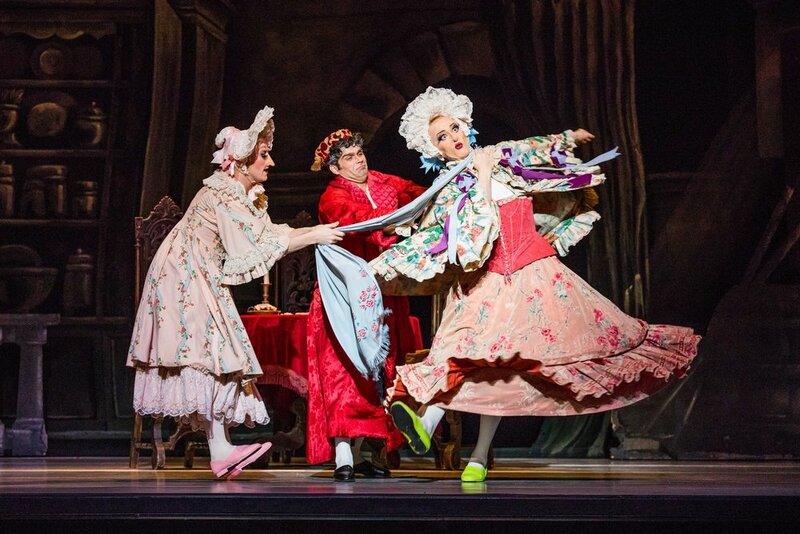 With a benign Father enfeebled by loss, the malevolent oppression of the Ugly Stepsisters blunted by their sillines and performative femininity, and a sympathetic and receptive Prince, the patriarchal role of this fairytale was thankfully null. That, coupled with Ashton’s decision to excise the notionally “national” dances and divertissements so frequently problematic in story ballets, leaves the viewer free to enjoy a classically danced tale, fully centered on a lively and lovely young woman who falls into requited love (and gets to live to enjoy it). The love story played out in the hall of the palace, which featured a set of central stairs and a few decorative sconces, but not before the audience was treated to some court dances. Generally a lull in the program, in this case the court dances were enlivened by a Jester, less the comic and more the emcee, and the capers of the Ugly Stepsisters. With winking reflexivity, they performed farcical send-ups of famous variations and pas de deux from the classical ballet canon. Their partners were a paunchy Napoleon and his foil at Waterloo, the ostentatious Duke of Wellington, who more than held their own in haughty absurdity. Demi-Soloist Joshua Whitehead as the Jester. Photo by Beau Pearson. In pointed contrast to the madcap, Cinderella entered, and Rex Tilton’s Prince leapt up from the foot of the staircase with great alacrity, then solemnly escorted her as she slowly and meticulously descended en pointe, step by step. Williams danced Cinderella’s solo with exceptional musicality, and executed the most precisely articulated manège, a sequence of difficult steps in a circular path, that one could wish to see. Tilton performed more with languor and fluidity than virtuosity, an uncommon approach to a men’s solo variation that was well-suited both to his physique and to the music. Their pas de deux was beautiful, actually quite moving, eliciting spontaneous applause from an arabesque promenade and other quietly striking moments. The same was true of Cinderella and the Prince’s final Act III duet; but first, the clock struck midnight, and Cinderella struggled through curiously mechanistic courtiers to then depart in rags. The third act consisted largely of iterations of previous material, beginning with a procession across the curtain of homebound ball-goers and leading into a recapitulation of Cinderella’s lonely, broom-partnered daydreams. This was not boring for its familiarity but rather refreshing, as it followed a full-cast ensemble at the end of the previous act and was executed wistfully. After the Prince arrived at Cinderella’s home, hijinks ensued, and after the shoe was finally fitted to its rightful foot, the lovers were whisked off to a quintessentially fairy-tale, starlit rendition of the palace hall. Their pas de deux was dreamy and featured another staircase moment, this time the totally unwavering descent of the Prince with Cinderella in a full press lift above his head. The happily-ever-after of Sir Frederick Ashton's Cinderella feels warranted, not the contrivance of many a romance, and it was satisfying to regard Ballet West bowing in character to genuinely thunderous ovation. Principal Artists Chase O'Connell and Beckanne Sisk. Photo by Beau Pearson. Nora Price is a Milwaukee native living and working in Salt Lake City. She can be seen performing with Municipal Ballet Co. and with Durian Durian, an art band that combines post-punk music and contemporary dance.